Surface charging: Surface charging to a high voltage does not usually cause immediate problems for a spacecraft. However, electrical discharges resulting from differential charging can damage surface material and create electromagnetic interference that can result in damage to electronic devices. Variations in low energy plasma parameters around the spacecraft, along with the photoelectric effect from sunlight, cause most surface charging. Due to the low energy of the plasma, this type of charging does not penetrate directly into interior components. Surface charging can be largely mitigated through proper materials selection and grounding techniques. Deep Dielectric or Bulk Charging: This phenomenon is a problem primarily for high altitude spacecraft. At times, when Earth is immersed in a high-speed solar wind stream, the Van Allen belts become populated with high fluxes of relativistic (>~1 MeV) electrons. These electrons easily penetrate spacecraft shielding and can build up charge where they come to rest in dielectrics such as coax cable, circuit boards, electrically floating radiation shields, etc. If the electron flux is high for extended periods, abrupt discharges (tiny "lightening strokes") deep in the spacecraft can occur. This and this question ask about spacecraft charging, but I would like to know how the measurement is done quantitatively. 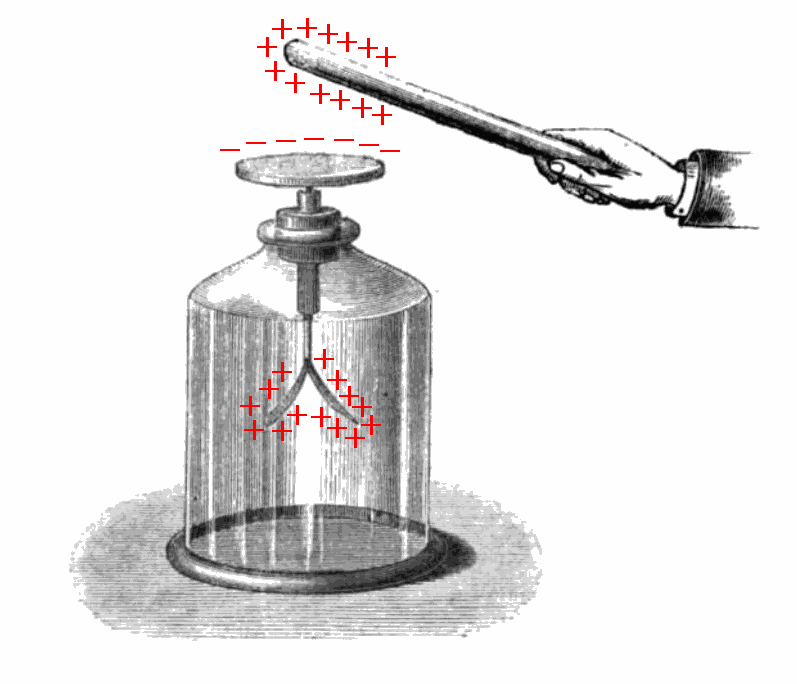 The drawing below shows an electroscope being used to detect the presence of charge on another object. It does not measure sign, and the displacement of the gold leaves depends on geometry - both shapes and separation of the rod and top-electrode of the electroscope. Spacecraft charging must be monitored to prevent mission-threatening issues, anything from perturbing the environment to be measured, to spacecraft arcing and system damage. Electron guns, field ionizers, and other things can be used to reduce spacecraft charge, but certainly the spacecraft needs at least some sign and magnitude information to do this, and for spacecraft that need to measure the local plasma environment, this is even more important. How does a spacecraft measure its own charge, both the magnitude and the sign? I'm looking to understand the principle behind the metrology, as well as roughly how it is implemented. So "With a charge measuring unit" wouldn't be sufficient here. Thanks! above: Illustration of a gold leaf electroscope indicating the presence of charge on the insulating rod held nearby. From here. 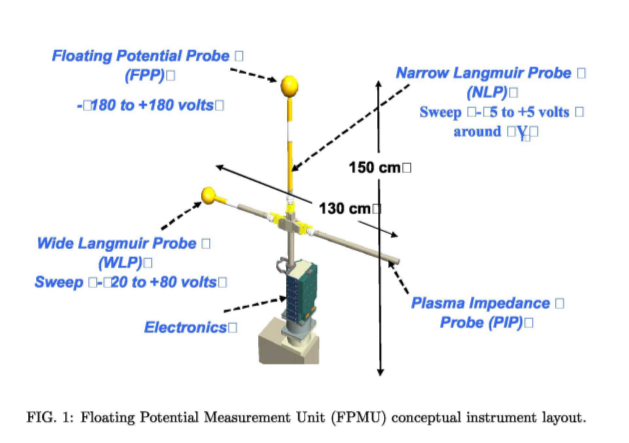 The Floating Potential Measurement Unit (FPMU) was developed by Utah State University’s Space Dynamics Laboratory (USU-SDL) to study surface charging of the International Space Station (ISS). The surface charging of the ISS is a complex problem owing to its large size, its variety of conductive/dielectric areas, and the exposed solar cell edges on its high voltage solar arrays. Not only is severe charging of the ISS a hazard for astronauts on Extra Vehicular Activity, but any resultant surface arcing can lead to functional anomalies and surface degradation on the ISS. Thus, the FPMU was developed under intense oversite and reporting requirements as it was deemed critical for ISS safety operations. Although the primary purpose of the FPMU remains to monitor charging levels of the ISS and provide a dataset that can be used to validate the ISS charging models 2, a secondary purpose is the measurement of electron density and temperature within the F-region of the ionosphere to aid in the understanding of why the ISS charges. Unfortunately, the FPMU is not operated continuously. It is activated by ground commands and data is recorded only for specific data campaign durations. Thus, it is essentially a “snapshot” instrument for ionospheric density and temperature measurements. Presented in the remainder of this section is a brief overview of the FPMU instrument suite. The next section presents the acquired data quality and the steps taken to compensate for noise and errors. This is followed by descriptions of the data processing algorithms to reduce the acquired data to plasma parameters such as electron and ion density (n e and ni) and electron temperature (T e ). We conclude the paper with a discussion and comparison between the FPMU derived plasma parameters and those derived from the International Reference Ionosphere (IRI) model and the Utah State University - Global Assimilation of Ionospheric Measurements (USU-GAIM) model. As illustrated in figure 1, the FPMU is an instrument suite comprising of four separate instruments [2–4]. Three of the instruments are based on Langmuir probe or DC electrical properties, while a fourth instrument is based on the radio-frequency (RF) properties of the probe. The Floating Potential Probe (FPP) is a gold-plated sphere of radius 5.08 cm. The sphere is isolated from the chassis ground by a high impedance circuit > 10" ohms. The FPP measures the ISS floating potential (φ fISS ) at the FPMU location within a range of -180 to +180 V at 128 Hz. The Wide-sweeping Langmuir Probe (WLP) is also a gold plated sphere of radius 5.08 cm and is swept with a triangular wave from -20 to +80 V relative to the chassis ground (i.e. the ISS structure) in 2048 voltage steps. The up-sweep is followed by a down-sweep of equal amplitude and sample length. The current resulting from the applied voltage sweep is measured on two different 12-bit channels: the low-gain channel and the high-gain channel. The WLP low gain channel has a resolution of 700 nA and the high gain channel a resolution of 3.5 nA per count of ADC. Thus, the high-gain channel has sufficient sensitivity to observe both photo emission and ion collection currents, and the low-gain channel is optimized for observing thermal electron currents. The Narrow-sweeping Langmuir Probe (NLP) is a gold-plated cylinder with radius 1.43 cm and length 5.08 cm. The NLP is placed mid-way on the boom supporting the FPP and is guarded on each side by gold-plated cylinders with radius 1.43 cm and length 10.2 cm that are swept in synchrony with the NLP. A sweep from -4.9 to +4.9 V, in 512 equal steps, is applied to the NLP during one second, followed by a sweep down from +4.9 to -4.9 V the next second. This sweep voltage is referenced to the floating potential as measured by the FPP. Thus, even this small sweep range should cover the electron retardation region and some electron saturation region, enabling determination of ne and Te at 1 Hz. The resulting current is again measured on two channels with different gains. The NLP low gain channel has a resolution of 175 nA and the high gain channel a resolution of 0.88 nA per count of ADC. The ground based laboratory calibration of the instrument showed that the WLP and NLP instrument noise was limited to just quantization errors. The Plasma Impedance Probe (PIP) consists of an electrically short dipole antenna that is electrically isolated from the ISS. It is operated in two different modes. In the Plasma Sweeping Probe (PSP) mode, the instrument measures the electrical impedance (magnitude and phase) of the antenna at 256 frequencies over a 100 KHz to 20 MHz range. In the Plasma Frequency Probe (PFP) mode, the antenna tracks the frequency at which an electrical resonance associated with the upper-hybrid frequency occurs. To minimize any interference between individual instruments the probe surfaces were set at least two Debye lengths apart for a worst-case rarified and cold ionospheric plasma. The tip-to-tip distance from the WLP to the PIP is 130 cm and the whole instrument stands about 150 cm tall. The FPMU interfaces with the ISS through the Video Distribution System (VDS) similar to an External TV Camera Group on the ISS. Thus, essentially the structural, electrical and communication interfaces of the FPMU with the ISS replicate an external video camera. The FPMU was carried to the ISS on STS-121 and deployed on August 3, 2006, on the starboard (S1) truss of the ISS. You can use a direct approach to the measurements. For sign, you can measure whether electrons are attracted to or repelled by the craft - or ions repelled or attracted. For field strength you can measure the acceleration of electron or ions. Or measure the energy they have after crossing a know distance. For example, see how much light they create when they hit something, or get through a screening grid with some electric potential. Or for acceleration, measure how long it takes for them to cross a known distance. For total charge, you need a process, not a simple measurement. Because spacecraft are not all conducting, and they have pointy bits like antenna, the charge distribution is not uniform, and neither is the electric field. You can take measurements all over an imaginary surface that encloses the craft, and develop an empirical formula for calculating charge based on the measurement of the electric field at some agreed on point. These methods are not absolute measurements if you are in a sea of charge, like the solar wind after charges are separated by the Earth's magnetic field. Not the answer you're looking for? Browse other questions tagged failure spacecraft-charging or ask your own question. How is charge dissipated in ion-propulsed spacecraft? Is a spacecraft able to measure it's current electric charge in some way? How could aerodynamic forces break up the Challenger orbiter? Were solar concentrators on HS-702 just a stop-gap measure until triple-junction PV cells were available? Historically, how risky are first launches of new rockets? What could be used to associate these fairing halves with their launches?